Oh what a race! This was one of the best. SO EXCITING. So disappointing. So rewarding. After the last race, we were feeling a bit low. We had a good start and yet came last again due to circumstances outside our control. This was also our home run…the run into Liverpool. We wanted a good result. We really wanted a good result. Londonderry gave us an incredible send off. A fantastic parade down the river and then a very tight start in the river mouth with some fluky winds and some funny tidal whirls. It wasn’t great for us. Shafted on the line when we were in the right of way. And a crappy start to the night. But I have to give props to the port watch first night shift. We killed it! Sailed very carefully and crept up a few places….or maybe the other boats dropped back a few places! When starboard watch took over they set a new tone in the early morning. They showed us we were going to play these wind shifts tacking along the northern Irish coast. We were chasing a wind shift out to the west of Ireland. The first few boats that got there would have an advantage the rest would have to fight harder and longer. Luckily thanks to some clever tacking on the shifts, some great sail trim and a slightly heavier boat than the rest of the fleet we made it in front of that shift. We started charging down the Irish coast to a virtual mark and unbelievably made it to the virtual mark first. Not by a long way but we were in the lead! Then surfing east past the fastnet rock before turning up the Irish Sea and st. George’s channel. This where the disappointment kicked in. Our heavy boat advantage, which had helped us keep upright and to punch through the waves on the way south now turned against us. We were sailing north, with the wind behind us and the spinnaker up and the Qingdao boat bearing down on us fast. Inevitably they caught and overhauled us. But then the panic really began. Garmin weren’t far behind them. It now looked like we might concede 2nd place as well. We pulled out all the stops as we approached the finish line. 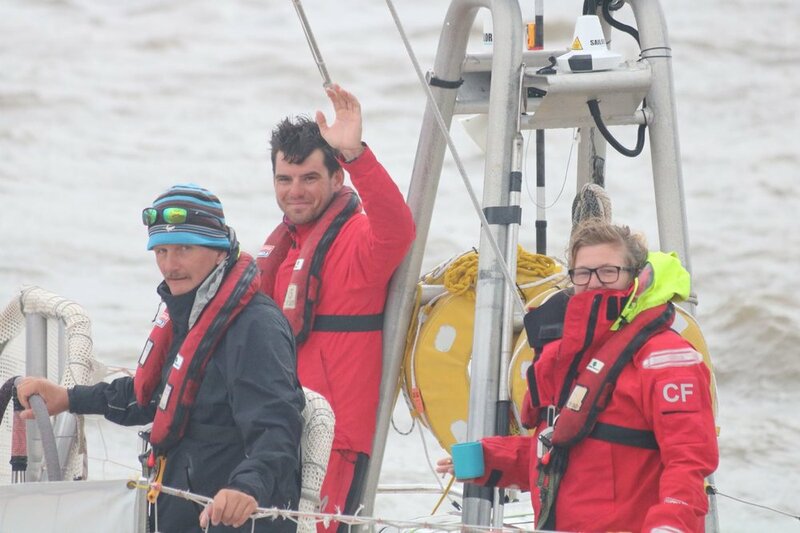 The off watch were first woken up to move to bunks on the high side of the boat as we started reaching for the finish line. When that wasn’t enough they were woken up to get on deck to sit on the high side - sorry guys! We watched the chart plotter closely and saw Qingdao ahead of us having a hard time in some fluky winds. Despite foreseeing it we still got stuck. Eventually this brought Garmin far too close. We finished the race just 6 minutes ahead of them! That was it. Our circumnavigation was complete! We had crossed our outbound track on the way up the Irish Sea - and as I have claimed many times we were the first boat to do in this Clipper fleet, so technically (by a really far stretch) we were 1st! We hung around to congratulate the other boats as they finished. Particularly, Sanya and Seattle who finished the overall race 1st and second - both female skippers - amazing and historical for sailing. The next day would be our final race on Liverpool 2018 down the river Mersey into the grand finish and last prize giving. Leg 8 Race 14 - Liverpool, U.K. Distance sailed: maybe 20 nm? This was the best race for me. This was basically in-shore racing. We had another Le Mans start. My skipper, Lance, was in charge of organising the start so he left me to organise the boat. Unfortunately/fortunately just before the start he wind started howling and all the boats were pretty heavily overpowered. Brilliant! Certainly was going to be a great spectacle and this is what these boats are designed for anyway. I thought Lance would grab the helm back once the start sequence had cleared and we were properly underway but he left me to it. As we made for the channel, fighting gust after gust, only a few metres from the other boats it was some of the most exhilarating helming..or so I thought. Again I assumed once we turned into the river that Lance would grab the helm for the close quarters stuff. He left me to it. We had a good rhythm at this point - Lance calling the shots, Claire Bear in the nav station, Nano getting soaked and battered on the bow calling the trim, all hand working their nuts off to keep the trim. We were holding good position. Then drama struck. We had been following a big cruise liner down the river but when it reached its dock it had to spin 180 degrees to go alongside. This meant the stern (the backside) swung out into the river cutting the river width in half as it did so. This was the point we were trying to overtake…with three other boats! A fierce tacking battle ensued. Lots of big bear aways and dips. Lots of screaming. And some amazing nerves from both Lance and myself to make it in front of boats by a dolphins hair. We came out on top and crossed the line in third place. Some of the most exciting sailing of the whole race. And we were finished. For me it took a while for the adrenaline and the high of this race to wear off. But no sooner had I come down from that cloud to realise I was still floating. This race had finished. 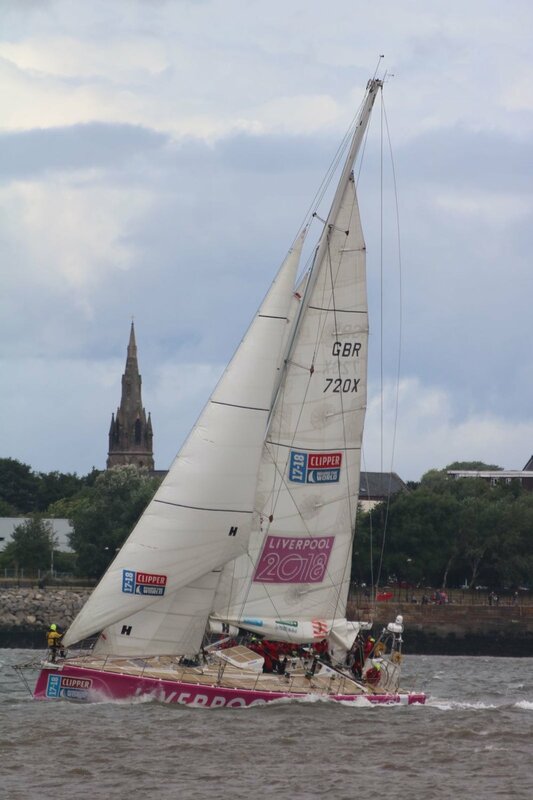 But so had Clipper Round the World Yacht Race 17-18! We really were done. We really had done it. I just circumnavigated the world. Even now writing this I cringe with the sensational-ity I am attempting to use but I really cannot coney the feeling. I didn’t expect it. I thought I would just take it in my stride I mean it had been a year coming. It had been over 7 years of dreaming, saving, wondering and hoping. The crowd on the banks were loud. We could hear them despite all the wind around us. The colours were awesome. We packed the boat up and prepared for our parade of sail. The short journey up and down the quayside and into Albert Docks was spectacular. What a welcome. Makes you feel kind of heroic. Most of the end of this is kind of a blur. I had amazing support from family and friends, the Keane-Simey’s, the newly ribbed Gibbs, McMillans and of course Moons. Lots of excited conversations. The final prize giving. Some beer. A case of pink Moet (thanks DeeDee). A million and one congratulations both given and received. So proud of our whole crew. So privileged to have met and sailed with them all. So proud of the Liverpool 2018 round the worlders, legends. So proud of my skips, Lancelot. So proud fo the fleet. Mostly so proud to have been part of it because of all these amazing people, to be counted in that number. Brand Consultant based in the Cayman Islands.